So, without further ado, here are some playtime recommendations that will surely get Fido’s tail wagging! Ah, a pooch-game as old as time! For certain dog breeds the game of fetch comes naturally and the only thing you need is a simple stick. Others, however, require some teaching. This is where fetch toys come in. The right toy for the game of fetch can make all the difference. Just make sure you don’t use regular Frisbees or tennis balls as these can hurt your dog’s teeth. Although almost all canines really love this game, it can be a bit tricky, so it is recommended that you enforce some ground rules to make sure it doesn’t get out of hand. 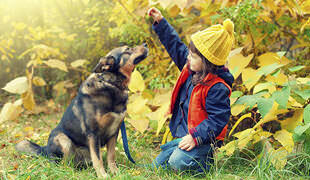 It is best to teach your pooch to release on command and closely examine your dog’s behavior during the tug of war. If he growls WHILE wagging his tail – that’s ok. If the growl becomes more serious and the tail is stationary – it is time to cool off a little bit. 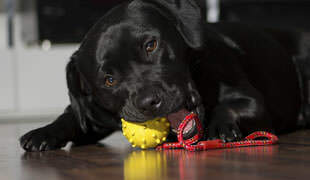 Check out some of the most popular tug of war dog toys here. Here’s another classic. In order to successfully play a game of hide and seek with your doggo you will want to grab his favorite treat, hide somewhere, and play the waiting game. Don’t make it too hard, though, as this game is supposed to be fun. Find a perfect place, call your furry friend and wait for him to find you. Once he finds you, praise him and give him his favorite treat. If you are patient enough, you can even teach your pooch to search for hide and seek toys around the house, hidden-objects-style! Here’s one that will get you both in shape! 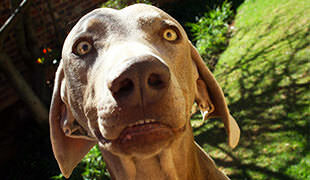 Most canines just LOVE to be chased and play keep-away. Find a near-by dog park and just run like there’s no tomorrow. A quick warning though – your dog will probably last a lot longer at this game than you will!